New Balance 1400 v5 are neutral racing running shoes. The renewed New Balance 1400 v5 is placed one step above radical racing flat Hanzo within american brand catalogue. 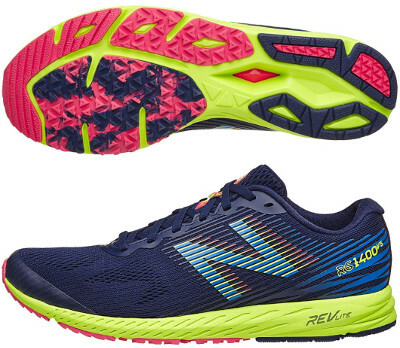 Thanks to its versatility, the 1400 v5 is a great option for speed work and tempo workouts to distances as long as marathon featuring more response than cushioning. With typical 10 mm drop and more space in toebox, current edition matches its counterpart with pronation control 1500 v3. Like any other annual update, besides price tag increase, upper has been changed from its predecessor 1400 v4. New engineered mesh is more breathable and follows latest trend of nearly seamless knitted fabric. Redistributed fused overlays (FantomFit) provide not only snug fit but also modern design along with well-known oversized N logo from New Balance on both sides. Cushioning relies again on full-length REVlite® midsole which delivers responsive and light cushioning. Some grooves on midsole's side wall have been modified to increase flexibility for smoother transition. There are many changes in completely redesigned outsole where flex groove divides forefoot in two areas with more aggresive triangular lugs to improve traction similar to those seen in mentioned Hanzo for quicker toe-off.